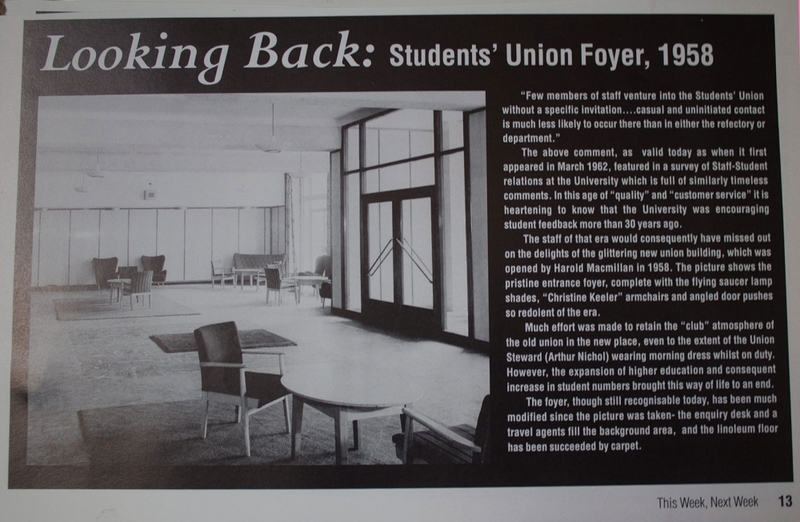 This picture shows the entrance foyer to the Student's Union building on Oxford Road dated 1958. The decor is very much of its era with flying saucer lamp shades, "Christine Keeler" armchairs and angled door pulls. The foyer has been renovated a few times since but you can still get a sense of familiarity and space looking at the picture. This is the foyer you pass through to reach two Academy venues: Academy 2 (Main Debating Hall) and Academy 3 (Hop and Grape). This image was culled from a publication called 'This Week, Next Week. We are unsure of the publication date. With thanks to Sean Fintan Morgan.